At least 500 farmers and other stakeholders in the carabao-based industry will attend the Third National Carabao Conference (NCC) on November 27-28 at the national headquarters and gene pool of the Philippine Carabao Center (PCC) in the Science City of Muñoz, Nueva Ecija. 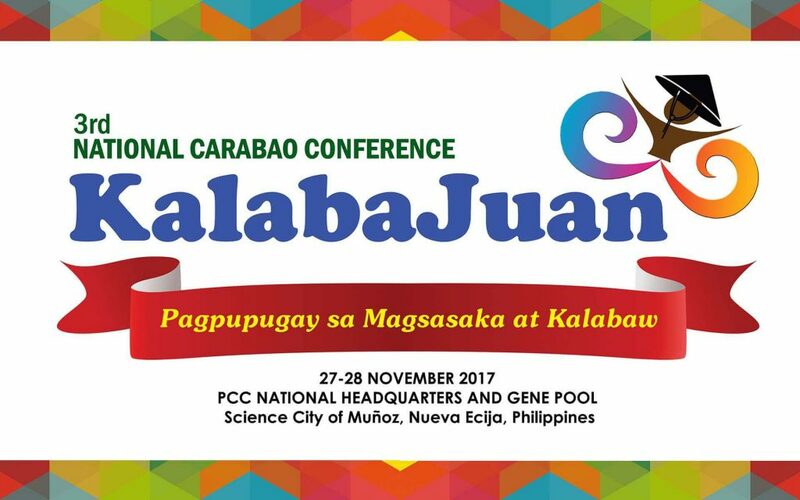 With the theme “KalabaJuan, Pagpupugay sa Magsasaka at Kalabaw”, the conference will serve as a venue for meaningful interaction, significant dissemination of information, exchange of ideas, and discussion of good practices that are expected to inspire more people to participate in the Carabao Development Program (CDP). The two-day conference will gather individuals and groups who are benefitting from the carabao-based industry, particularly local government officials and representatives from various government agencies and private organizations that are actively involved in the implementation of the CDP, which is considered as PCC’s flagship program. Senator Joseph Victor Ejercito, chairman of the Senate Committees on Health and Demography and Urban Planning, Housing and Resettlement; and Congresswoman Cecilia Leonila Chavez, representative of Butil Farmers Partylist; are expected to be present in the event as guests of honor. According to Khrizie Evert Padre, Information Officer II of the PCC’s Knowledge Management Division and the overall chair for the third NCC, this event will recognize and honor the contributions of farmers and the farmers’ docile and reliable ally in the farm and in their livelihood – which is the carabao. “They are the living testimonies that there is indeed triumph in carabao farming as long as you put your whole heart and throw all there is of yourself in this endeavor,” Padre said. On the first day of the conference, there will be breakout sessions under the activity titled “KalabaJuan 101”. This will involve discussions of exemplar practices on dairy carabao production (kwento at kwenta), nutrition, reproduction, prevention and control of common animal diseases, improved forages production and conservation, and feeding management. Highlights of the event include the launching of “Gintong Kalabaw Cup” via an infographic video presentation and awarding of winners for “Modelong Juana sa Kalabawan”, “Modelong Kabataan sa Kalabawan”, “Outstanding Dairy Buffalo”, “Best Dairy Cooperative Category”, and “Outstanding Dairy Buffalo Farmers for Smallhold, Family Module, and Semi-Commercial Categories”. Other activities lined-up for the conference are products exhibition of suppliers, convergence meeting of partner-stakeholders in the industry, and simultaneous signing of partners, farmers and other stakeholders on the commitment board to support the carabao industry. The second day of the event will be capped with discussions on the Agricultural Credit Policy Council’s “Production Loan Easy Access (PLEA) Program”, and lecture-demo on “Milk Testing and Proper Milk Handling”, and “Feed Processing/Baling or Chopping”.